Just like Magic! Abracadabra! This charmed illusion pearl necklace collection is magically inspired. Like charmed pearls, each illusion pearl will follow your every move. They are magically transfixed and mesmerized by your unique enchantment. You will feel like a magical enchantress while wearing this illusion pearl necklace. Delicate but strong nylon filament provides the special effects magic of the enchanted floating pearls in an illusion pearl necklace. Each illusion pearl will seemingly hover. Illusion pearl necklaces are just so much fun! 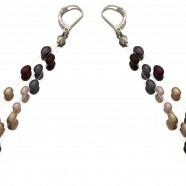 The illusion pearl necklace collection comes in a variety of colors. From delicate white and pink, to bold green and black, and, of course for those truly adventurous, a rainbow of colors, an illusion pearl necklace is sure to delight! With all these choices, there is the perfect illusion pearl necklace for every mood and every occasion. While wearing a classic white illusion pearl necklace, fine clouds of wonderful white pearls will magically float with your every move. Like perfect little white clouds from the sky, each white illusion pearl will hover with you. Next, we have a pretty and fun pink illusion pearl necklace. Like a magic spell, each pink illusion pearl will glide with you. Or, are you feeling bold? How about wearing the lush color of an enchanted forest in the green illusion pearl necklace? Relive your childhood fairy tales wearing a charmed green illusion pearl necklace and you will take the fairy enchantments with you! Wearing a rich, deep black illusion pearl necklace and prepare to mesmerize. Enchant them with your magic! Illusion pearl necklaces are simply spellbinding! Can’t decide? How about wearing an entire array of dazzling colors from all of the illusion pearl necklaces? Illusion pearl necklaces are so much fun and so lovely. You’ll be enchanted by their spell! This entry was posted in PearlsOnly and tagged pearl necklace by PearlsOnly Team. Bookmark the permalink.